The big box book chain stores are dying like flies, next target is the iPad and the publishers themselves. they throw you a bone and you're ready to put on your shill hat? Fleet Foxes, "Fleet Foxes"	Slightly Stoopid, "Chronchitis"	Taylor Swift, "Speak Now"	Sublime, "40 Oz to Freedom"
The Avett Brothers, "I and Love and You"	311, "Music"	311, "311"	Russell, Leon, "Will O'The Wisp"
We thought you'd like to know that eligible songs from 25 CDs you have purchased from Amazon are being added to your Cloud Player library. This means that high-quality MP3 versions of these songs are available for you to play or download from Cloud Player for FREE. You can find your songs in the "Purchased" playlist. Please note that some songs from the above CDs are not eligible for this feature and may not be available in your Cloud Player library. That's pretty awesome. I got that email just now. By the way, I bought that Leon Russell album from Amazon in January of 2000. "Soon, the world will be [Amazon]." I wish I had the strength to resist. Right now, I do not. Well they're definitely taking over South Lake Union and the Denny Triangle. That area is blowing up. Last edited by MarkGrace; 01-28-2013 at 03:51 PM. I love Amazon Cloud player. Far superior to iTunes in my opinion. A big steaming pile of poo is far superior to itunes. Has anyone noticed the new "Add-On" program at Amazon? Now certain products are ONLY available (as far as I can tell) when you make an order $25 or larger, if for Amazon Prime members. I just tried to buy a $5.95 item, which is available for free shipping w/ Prime, except that Amazon won't complete the order unless I add another $24.05 worth of products to my cart. So basically, for some items, Amazon Prime only gives you free 2-day shipping if you're buying more than $25 worth of goods. I can't even buy it if I offer to pay normal shipping. With the app, which is available on iOS and Android, Amazon Prime subscribers have the option of free two-hour delivery — or delivery within an hour for $7.99. The app also encourages you to pay a $5 tip to the couriers. Prime Now service finally launched for select zip codes in Austin on Wednesday, making it the sixth city in the nation to have it. Prime Now originally launched in New York City in late 2014, later expanding to Baltimore, Miami, Dallas and Atlanta. In the name of journalism, The Daily Texan tested out the service by placing two separate orders for two very important items. The first was a Barbie Collector’s Edition Texas A&M University Ken Doll, at the request of Texan film critic Alex Pelham. The second was 125 feet of bubble wrap, because the Texan knows how to have fun. The first item was hyper-specific, the second big and bulky. I think I'll order me up some bubble wrap! What? And pass on the Barbie Collector’s Edition Texas A&M University Ken Doll??? Came wrapped very safely and nicely in a box. Love this doll because I am an Aggie fan and so is my sister. I got two so she can have one too. I had heard jokes, mostly from Longhorn fans, of Aggie cheerleaders yell leaders wearing janitor uniforms. At the time, I thought it was just a funny observation. But during parents' orientation for Freshmen students, the yell leaders had a part of the program and were explaining the origins of some of the many traditions at Texas A&M. When the yell leader explained that their uniforms really did originate from a janitor's closet, I started laughing and said to my wife that I thought that had been made up. Other Aggie parents didn't find my outburst amusing. There's a good chance I'll be attending another Aggie parents' orientation in a couple of years so I'll have to remember to behave myself. Laugh all you want about the yell leaders taking the place of cheerleaders and having to wear janitor uniforms, but they have a very good engineering college down in College Station. Also, if you use this card with subscribe and save (and have 5 subscribe and save subscriptions) you can save 20% on those subscribe and save items (15% for signing up for 5 subscribe and save items and 5% with your new amazon prime card). Pretty sweet deal on tons of items that you likely use and buy anyway. Evidently I am missing out. What else do you all have on subscription at Amazon? What else do you all have on subscription at Amazon? American Girl magazine. That's it. You don't have that on subscription?! You are missing out my friend. We only have the virtual Amazon Store Card (5% back on all AMZN purchases), not the Visa Rewards card. BTW... I agree with the OP. Amazon has, essentially, taken over the market that I work in (SMB hosting). My employer has completely given up on the space. Subsequently, I had to move my personal web/mail server to another provider... after 20 years of being the same place. But did I capitulate like Meg Ryan in You've Got Mail and move to AMZN?! Having been rebuffed by literary agents when trying to get prior books published, Weir decided to put the book online in serial format one chapter at a time for free at his website. At the request of fans, he made an Amazon Kindle version available at 99 cents (the minimum he could set the price). The Kindle edition rose to the top of Amazon's list of best-selling science-fiction titles, where it sold 35,000 copies in three months, more than had been previously downloaded free. This garnered the attention of publishers: Podium Publishing, an audiobook publisher, signed for the audiobook rights in January 2013. Weir sold the print rights to Crown in March 2013 for over US$100,000. The book debuted on the New York Times Best Seller list on March 2, 2014 in the hardcover fiction category at twelfth position. Who wants the old school style of the publishing business again? Don't have a mirror? Now you can pay Amazon $199 to have Alexa to take a creepy full-body 360* shot of you and tell you your outfit looks bad. • See yourself from every angle with the companion app. Build a personal lookbook and share your photos. Amazon said Friday it plans to acquire Whole Foods Market for $42 a share, in a deal valued at $13.7 billion. Whole Foods CEO John Mackey will remain CEO of the grocery store chain after the deal closes, and the store will continue to operate under the Whole Foods brands. Whole Foods has been under pressure from Jana Partners hedge fund and money management firm Neuberger Berman, which have called on Whole Foods to sell itself. The investors have criticized Whole Foods for its poor performance, and have suggested the chain could be merged with another grocer. Amazon has been pushing to expand its online grocery business. When will Amazon get into the shipping business? Wow. Never figured you to be a Whole Foods kind of guy. I love the warning about it not being pasteurized and therefore it may contain harmful bacteria and should be avoided by children, the elderly, and people with weakened immune systems. Who the crap would buy something like that? 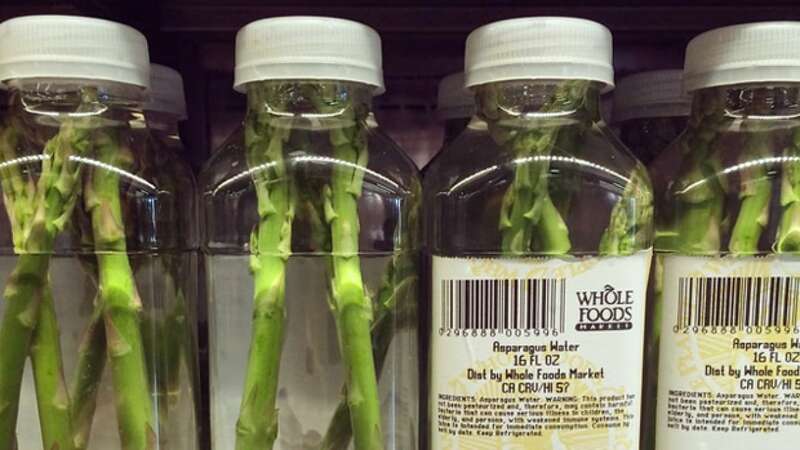 The story about the asparagus water is almost as funny as the product itself. Maybe they're just extremely light. Amazon's HQ2 finalists were announced recently and David Burge gave a rundown of the pros and cons of each city. Last edited by falafel; 01-19-2018 at 11:58 AM.